The Fixman Safety Vest is versatile for construction and maintenance work. Features breathable mesh fabric, reflective markings and handy velcro closure. Includes: 1 XL Vest. 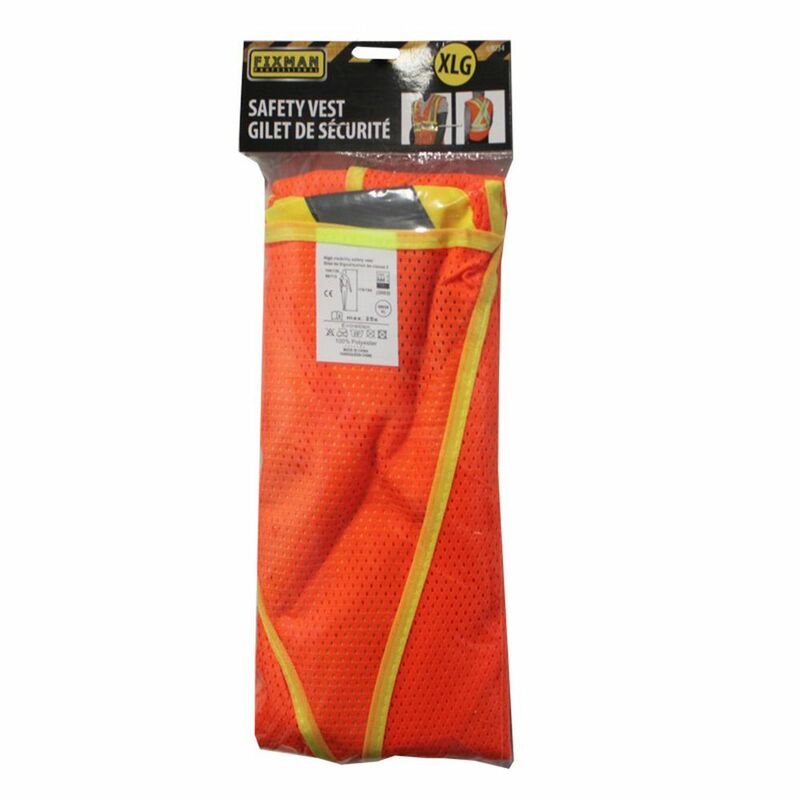 Holmes Multi-Pocket Tool vest is made of sturdy 100% Polyester mesh, this vest has reflective safety bands for high visibility in the dark. Adjustable shoulders and sides make for easy wearing. Adjustable tool compartments, RMV tool pouch, hammer loop, measuring tape holder slot all multi-functional features which makes this vest a must have for carpenters and worker who like easy access to their tools. One size fits most. Powered by M12 REDLITHIUM Battery Technology, the Milwaukee<sup></sup> M12 Heated Vest uses carbon fibre heating elements to create and distribute heat to the chest and back. Wind and water resistance combined with a thermal fleece lining provide protection from the elements and allow for three-season versatility. Reinforced with GridIron 900 Denier Ripstop Polyester to Outlast 12oz cotton duck work wear by 3X against abrasion and tear, the vest also features riveted, reinforced pockets and a tarnish resistant metal zipper to survive the jobsite. The 3XL black MILWAUKEE M12 Heated AXIS vest is designed to protect from the cold and weather on the jobsite. Powered by M12 REDLITHIUM Battery Technology, these heated vests use carbon fiber heating elements to create and distribute heat to the chest, back and shoulders. A single touch LED controller heats up the battery heated vest to three heat settings. This MILWAUKEE heated vest has a new Quick-Heat funtion that creates and districutes heat three times faster than previous vests and market competitors. These vests are built with hybrid AXIS Ripstop Polyester providing a lightweight, compressible design that can be used as an outer shell or a mid-layer vest and protecting from wind and water. M12 Heated AXIS vests are designed to protect from the cold and weather on the jobsite. Powered by M12 REDLITHIUM Battery Technology, these heated vests use carbon fiber heating elements to create and distribute heat to the chest, back and shoulders. A single touch LED controller heats up the battery heated women's vest to three heat settings. This MILWAUKEE heated vest has a new Quick-Heat funtion that creates and distributes heat three times faster than previous vests and market competitors. These women's vests are built with hybrid AXIS Ripstop Polyester providing a lightweight, compressible design that can be used as an outer shell or a mid-layer vest and protecting from wind and water. Battery and Charger sold separately. Safety Vest XL The Fixman Safety Vest is versatile for construction and maintenance work. Features breathable mesh fabric, reflective markings and handy velcro closure. Includes: 1 XL Vest. Safety Vest XL is rated 3.0 out of 5 by 2. Rated 5 out of 5 by Md AK from Good product I bought this safety vest online about a month ago and it is very good for it's price.